CEO John Felts of Cruz Foam loves surfing, but not the Styrofoam in the surfboards he uses to ride the waves. “Surfers care deeply about the ocean and environment. However, the equipment we ride couldn’t be more toxic,” Felts says. Modern surfboards are made from Styrofoam, which takes more than 500 years to degrade and is one of the biggest offenders in the mounting problem of pollutants in the environment. As a graduate student at UC Santa Cruz, Felts learned about a bio-polymer found in shrimp, lobster and crab shell waste that can be turned into a non-toxic, biodegradable and sustainable foam material. Cruz Foam is transforming the shell waste into eco-friendly surfboards, and plans to expand to products for the auto, marine, construction and packaging industries. The company is a two-time winner of the Startup Challenge. Cruz Foam took the top prize of $1,500 in the Student division in 2017, and then won the $20,000 Venture division award in 2018. Both wins came at make-or-break moments for the company. Felts had placed second with his surfboard idea at Grad Slam 2017, an annual competition for University of California grad students who sum up their research in three-minute presentations for a general audience. But Felts wasn’t sure his idea could be turned into a viable business until his team entered and won the Startup Challenge shortly after. It’s a great opportunity. The real benefit is you’re going to get tied to a strong entrepreneurial ecosystem in the Monterey Bay region. “We were in limbo. We had not been incorporated yet, and we didn’t know what we were going to do. Winning definitely pushed us over the edge, and told us we have a something worth pursuing here. We incorporated the next month. It was a really big turning point for us,” he said. 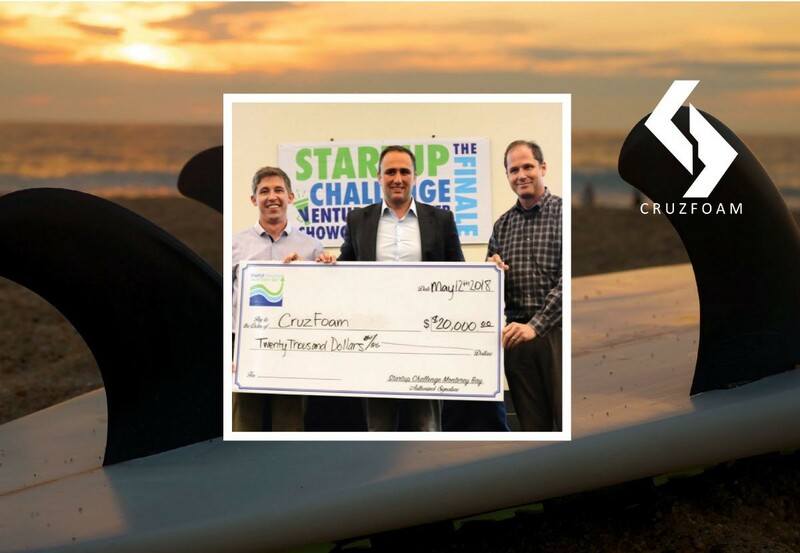 When Cruz Foam entered Startup Challenge again in 2018, they were languishing as funds invested by friends and family were quickly running out. Winning the competition saved the company. Cruz Foam is busy working on a six-foot, full-size prototype surfboard in its Santa Cruz lab. The company has already built a half-size, three-foot version. Cruz Foam recently completed participation in two leading accelerator programs, Plug and Play and Alchemist Accelerator, and were featured in Forbes magazine for having the “most unusual idea” at Plug and Play’s spring showcase. Late last year the company was on track to finalize a deal with a strategic partner. Felts recommends entering the Startup Challenge to any budding entrepreneurs who want to educate themselves, test their ideas and make connections. Katie Raquel, owner of Katie's Coldpress, and her juice products. Katie Raquel discovered the benefits of raw juice as a new mom looking for healthy food options. It gave her newfound energy and helped clear up lingering health issues, she said. When she couldn’t find it for sale anywhere on the Monterey Peninsula, the idea for Katie’s Coldpress raw organic juice was born. Raquel entered the Startup Challenge in 2014 and took first place in the Main Street division. Winning the competition contributed to her business’s success in “a very direct way,” she said. The $10,000 prize money enabled her to purchase the hydraulic press she needed to make the juice. Preparing for the competition gave her the confidence to quit her job as a teacher and start the business, she said. She advises other prospective entrepreneurs to look at the Startup Challenge as an opportunity to learn and reach the point where you know how to start your business. Don’t focus too much on winning. Winning is a bonus. ... The important part is doing all the work. You can leverage that in a lot of ways. The last several months have been exciting times for Katie’s Coldpress. Over the summer, HBO used Katie’s juice in multiple scenes while filming season two of the hit series “Big Little Lies” in Monterey, where the company is headquartered. In November, Raquel was a featured speaker at JuiceCon! in Venice Beach, the first ever conference for juice-industry professionals. In January, Katie’s was scheduled to reach a major milestone with the opening of its first juice bar at The Presidio of Monterey. 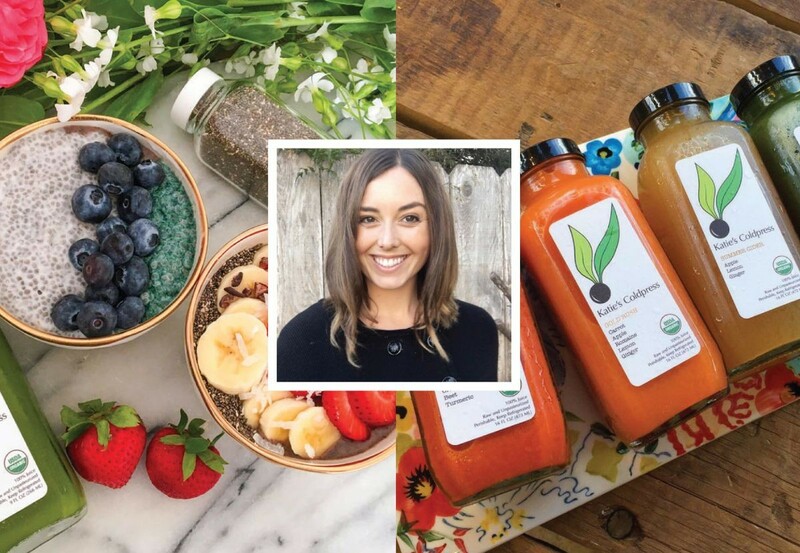 Prior to the opening of the juice bar, customers could only purchase Katie’s juice from booths at the Old Monterey and Carmel-by-the Sea farmers markets on Tuesdays and Thursdays, or order it for weekly delivery on Mondays in Monterey County. The Presidio juice bar, which also offers iced coffee drinks and organic raw food items, is accessible solely to military personnel and staff at the base. Raquel wants to open a second location outside the base in the near future. “We are planning to follow this project up with a second juice bar in Monterey County as soon as we find the right space. We want to be able to serve everyone,” she said. 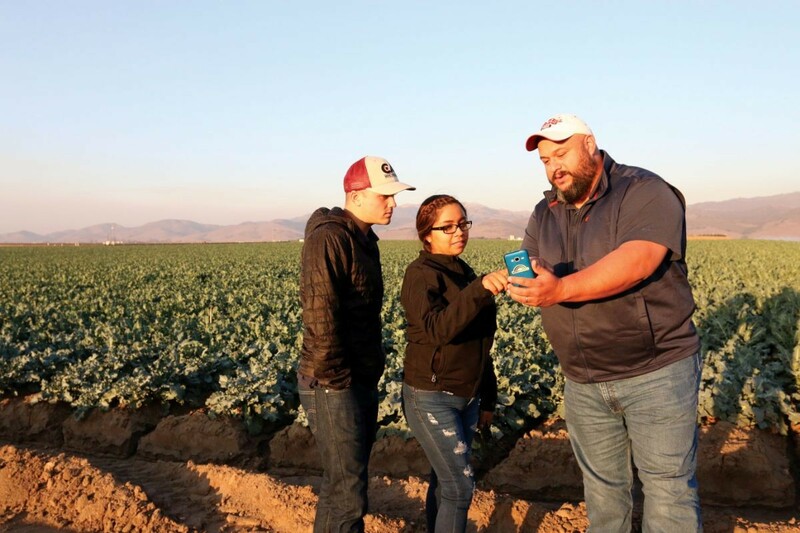 HeavyConnect co-founder Patrick Zelaya (right) and two employees use the company's mobile app by a customer's broccoli field in Salinas. In the heart of the “Salad Bowl of the World,” Salinas-based HeavyConnect is bringing high tech to the farming industry. The company’s mobile applications help agriculture companies improve farm management. “HeavyConnect is a platform, not unlike Microsoft Office, with different modules. The goal of the platform is to remove paper from farming operations, to simplify, and increase efficiency,” co-founder Patrick Zelaya explained. Zelaya left a career as a John Deere sales manager to start HeavyConnect. He realized the technology used on tractors, similar to the “black box” on an airplane, could be applied in a better way. “A black box will tell you everything about the plane crash, but it won’t prevent the plane crash. That’s what I wanted to do,” Zelaya said. The company’s first app asked tractor drivers to answer questions on a daily safety checklist. The information gathered let farm managers know when something was about to go wrong. Farmers wanted help with employee time cards, quality assurance, pest scouting and, more recently, food safety. The common theme was “digitize my paper processes and my work flows,” Zelaya said. Our success has been in large part a result of the support we get from our community in the Salinas Valley and from CSUMB. The company kept simplicity in mind while developing its applications, because farm workers are often not accustomed to using mobile technology. “We used fewer words, we color-coded, used large colorful buttons,” he said. The mobile apps improved efficiency remarkably. Tasks formerly done on paper take “anywhere from 20 percent to as little as 2 percent of the time,” he said. In addition, the information gathered is more detailed, accurate and useful. From the beginning, CSUMB computer science students have played an integral role in the company. The company’s first developers were CSUMB students. Zelaya has since hired CSUMB graduates, including two of the original coders, and currently has four seniors interning with the company. “We’ve tried to do that consistently with CSUMB since we started. Those students usually have agriculture in their background. Their parents are involved in farm working. They understand how to build technology, and they understand why, and they understand who it’s for. So that’s just a perfect combination for us,” he said. HeavyConnect won the Venture division of the Startup Challenge in 2016, giving Zelaya confirmation the business could succeed. Top startup accelerators agree. HeavyConnect has participated in 500 Startups and Techstars, recognized as two of the best accelerator programs in the world, according to Forbes magazine. The programs have an acceptance rate as low as 1.5 percent, meaning for every 7,000 applications, only 106 spots will be available. HeavyConnect is now focused on growth. The company completed its first round of seed funding at the end of last year, receiving $4 million from a strategic investor. Read a related story about the iiEd and its ongoing efforts to build our region's economic ecosystem. Learn more about the College of Business and how to get involved with iiED.